New Delhi: Shares fell more than 1% on Thursday after a sharp rebound in the previous session, weighed down by lingering concerns over slowing domestic growth and government policy inaction. “The market is tracking global cues and also there are continuing headwinds at home, which is leading to a lot of negative sentiment building," said K.K. Mital, head of portfolio management services at Globe Capital Market Ltd in New Delhi. “I expect the market to remain rangebound with a negative bias in the coming days." 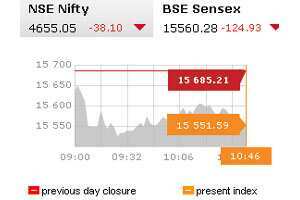 At 10:30 am, the main 30-share BSE index was down 0.58% at 15,594.98, with 20 of its components in red. It fell as much as 1.2% in early trade. The index had gained 3.4% on Wednesday to its highest close since 29 August, snapping five sessions of losses. It is down nearly a quarter this year, hit by foreign fund outflows, and is the world’s worst-performing major equity market. Foreign funds have been net sellers of more than $500 million worth of Indian shares so far in 2011, compared with record net buys of more than $29 billion in 2010. Infosys shares were down 2.5% at Rs2,676.50, while Tata consultancy fell 1.5% to Rs1,141.80. Third-ranked software exporter Wipro was down about 2% at Rs399. The stocks have outperformed the broader market in the current quarter, helped by a sharp fall in the local rupee currency against the dollar. The companies get most of their revenue from the United States and Europe, but bulk of their spending is in the local currency. “Currency is there in the stock price already, but what is not there in the price is the slowdown," said Ambareesh Baliga, chief operating officer at Way2Wealth Securities. Banking stocks eased after Wednesday’s rally. Sector leader State Bank of India was down 1.1% after gaining 2.9% in the previous session, while No.2 ICICI Bank fell 2.2% after surging 7.5% on Wednesday. Shares in Reliance Industries, India’s most-valuable firm, were down 0.6% at Rs743.35. Reliance said it bought a minority stake in Terra Power, a US-based nuclear-technology design and engineering company. In the broader market, there were 748 decliners for 504 gainers on total volume of 119 million shares. The 50-share NSE index was down 0.51% at 4,669.25. Asian shares fell as doubts remained over how much of the funds banks raised from an inaugural long-term European Central Bank tender will actually flow into struggling euro zone economies and help restore confidence. • Yes Bank rose 1.5% to Rs254.15 after the lender said it raised savings deposit rates to 7% from 6% for domestic customers with immediate effect. • Thinksoft Global Services Ltd jumped as much as 12.6% after the company said it signed a Rs50 million contract with the Reserve Bank of India.